After week 6 of the NFL season the Arizona Cardinals are 4-1 including their bye week. Maybe, most importantly, also after week 6 of the NFL season the Arizona Cardinals sit atop of the NFC West above both the 49ers and the defending Super Bowl Champion Seattle Seahawks. 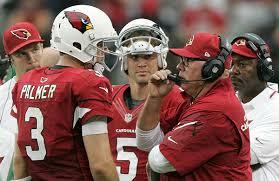 Pictured are Quarterbacks Carson Palmer and Drew Stanton with Head Coach Bruce Arians. One of the most important stats in determining a winning team, no matter what the sport, is takeaways and giveaways. In other words, how many times have you given the ball away to your opposing team, and how many times you have taken the ball away from your opponent. Quite possibly the biggest reason for the early success of the Arizona Cardinals are the possessions. The Cardinals have taken the ball away from their opponents 11 times in 5 games with 3 off fumbles and 8 off interceptions. But despite the fact that they have been forced to use not only their back-up, but also last week their 3rd string quarterback, they have zero. Zero interceptions in 5 games, that is almost unheard of. To make the statistic even more impressive, as a group, the three quarterbacks have thrown 223 times without an interception. Plus, for a little bit of perspective, the next closest team with the highest number of passes in a row without having thrown an interception are the New England Patriots. And how many times has Tom Brady currently thrown in a row with out an interception? The number is a measly 79.